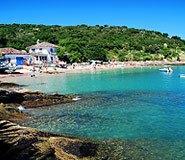 Discover Buzios during your price guaranteed Brazil vacation. All of our Brazil tours have daily departures and are fully customizable. Located just a few hours’ drive from Rio de Janeiro, this gem of a town offers a welcome respite from the hustle and bustle of The Marvelous City. Bountiful white sand beaches bordered by lush vegetation offer fabulous opportunities to soak in the tropical sun and rub shoulders with friendly locals and national tourists alike, not to mention people from all over the world. Many a famous face has found temporary refuge in the tranquil scenery and breezy pousadas of Buzios, most famously Brigitte Bardot in the 1960s. With more than 20 idyllic, white sand beaches stretched out over only 5 miles of peninsula, the Brazilian beach resort town of Buzios is a paradise for any lover of sun, sea, arts, and ecology. Once a popular hideout for European pirates, the beautiful Buzios is now a haven and weekend getaway for Brazilian locals and foreigners seeking to escape the hustle and bustle of Rio de Janeiro, which is just 100 miles to the west. It is no wonder the town swept legendary movie starlet Brigitte Bardot off her feet when she arrived to escape the pesky paparazzi in the 1960s. While Buzios has grown somewhat since then, it still retains its alluring charm for all who are lucky enough to spend some time here. Visitors to Buzios are spoiled for choice in just about every aspect: small laid-back pousada inns or private luxury lodging, international gourmet dining or handheld seafood delicacies eaten while reclining on the sand, adrenaline inducing water sports or hammock under a palm tree, pulsating DJ beats at an all night club or early trekking starts in an ecological reserve – Buzios has so much variety that perhaps the only unquestionable certainty is that you will want to return. Whatever the reason for visiting Buzios, there is literally something for everyone. Whether coming from nearby Rio or from the more distant Salvador da Bahia, a visit to this unforgettable beach town during your Brazil vacation is a must. 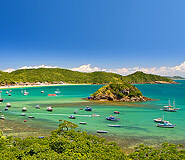 Buzios is ideal not only for lax beach-goers but also for the more adventurous travelers, as the crystalline waters provide excellent snorkeling and diving opportunities, both close to town and around the many off-shore islands. Consistent wind and boisterous surf on certain southern beaches are a dream come true for aficionados of surf, kite surfing, and windsurfing. Visitors to the area can also get close to nature by embarking on a jaunt through some of the numerous protected areas, such as Emerências Reserve, where some of the last remaining examples of untouched Brazil wood forest still stand. You can also visit the Taua EcoCultural Complex, where you can observe birds, primates, reptiles, butterflies, and endemic flora in its natural state. Lastly, Buzios is home to a vibrant strip of shops, bars, and restaurants where locals and visitors from all over the world congregate in a laid-back friendly atmosphere. The Rua das Pedras is the perfect place to see and be seen, make new friends, and dabble in the town’s energetic nightlife. Buzios is one of Brazil’s top tropical paradises with an average annual temperature of 77°F (25°C) and 254 sunny days a year. You might see some clouds on the horizon once in a while, but usually they are due to humidity and do not augur rain. In fact, more important to consider than weather is the timing of your traveling period. Mid-December to mid-February is Buzios’ peak travel season, January being the most intense of them all, when people take advantage of the free rolling South American summer. March to December is the low season when the crowds thin out a bit and there is more room to lounge freely on the beaches. One of the oldest hotels in the area, Casas Brancas is a stylish and delightful boutique hotel beautifully nestled on hills facing the breathtaking bay of Buzios. Elegant architecture and individually decorated rooms characterize this luxurious accommodation, which boasts a Mediterranean feel with hammocks and terraces throughout. The new relaxing spa completes this rich atmosphere. Additionally, Casa Brancas is home to Café Atlantic, one of the best restaurants in town offering Mediterranean fusion cuisine where the first-rate chef prepares traditional recipes that incorporate regional ingredients. Located just steps away from the beautiful Joao Fernandes Beach, known internationally for its beauty and charm, the Rio Buzios Beach Hotel combines the highest standards of quality and service with an ideal location and stunning vistas. Harmoniously blending with its natural environment, this excellent hotel features 64 immaculate rooms equipped with a king-size bed, air conditioning, cable TV, mini bar, safe deposit box, and balconies overlooking the ocean or the pool. For a touch of luxury, request one of the deluxe rooms which boast their own Jacuzzi. In the restaurant, guests will find an array of delicious Brazilian and international dishes, as well as a generous buffet breakfast. Among the amazing amenities of the Rio Buzios Beach Hotel are also a pool, steam sauna, gym, game room, bar, and tourist office to organize your excursions around town. 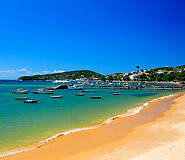 Located in the center of Buzios, the Pousada Barla Inn provides easy access to the city's commerce and entertainment. The inn boasts personalized service and first-class accommodations that include a sparkling swimming pool and a restaurant that serves both international and indigenous cuisine.